Back in 2015 I blogged about Glam Cubes, and reviewed their 4-level acrylic makeup storage unit in this blog post. I was so impressed with the quality of the organiser, that I purchased a second 5-level acrylic makeup storage unit too (ya’ll already know I own way too much makeup for one person). Each unit rests on either side of my vanity table and currently store about 60% of my makeup collection. I like to keep the makeup products I use most often at my fingertips, and the rest are stored in my IKEA MALM drawers. ♥ There’s a sneaky peek of my makeup collection. ♥ Everything you need to know about Glam Cubes is detailed in the post. ♥ I also listed makeup organisation storage tips in the post. Anyway, so Glam Cubes recently added a couple of new products to their range of acrylic storage units. There are 2 new makeup brush holders and 1 makeup palette holder. When they sent me their first brush holder design (the GBH001 unit), I wasn’t a fan. I didn’t like the flip top – I found it was difficult to remove the brushes, because I had to reach in from the top and pull them out by their brush heads. I shared my thoughts and concerns with them, and sent them some ideas on designs that I thought would be much more user-friendly. A couple of months later, they sent me an updated design with an angled flip top lid – exactly what I had in mind! I still use the original 3-compartment brush holder, but I like to store my Urban Decay (review), Too Faced (review), Sleek Makeup, and theBalm eyeshadow palettes in there (it’s the perfect height & depth / width). 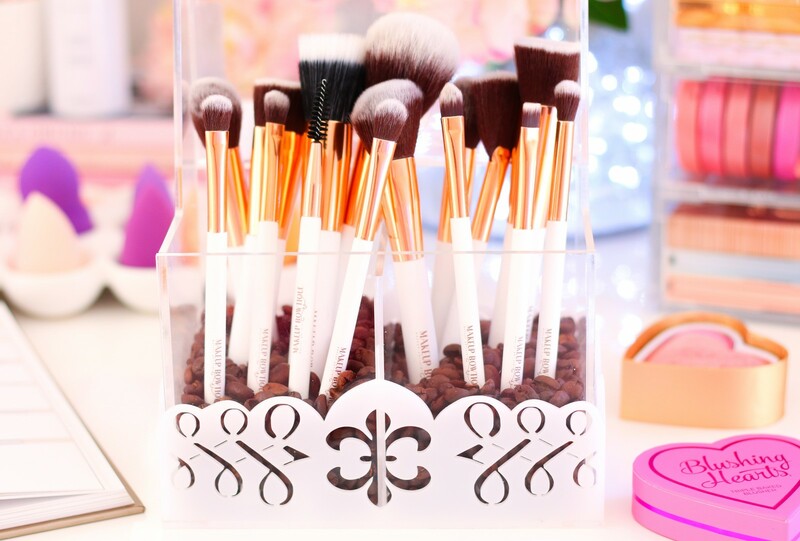 The updated Glam Cubes Makeup Brush Holder has 2 compartments and is a bit smaller than the original (which had 3 compartments), but I’m sure they’ll expand their brush storage family at some stage to include larger units. Goodness knows, if you’re a brush hoarder (like moi) then then a XXL size is definitely the way to go – haha! As mentioned the new design, features an angled flip top lid with a cute little oval-shaped handle. I really like this design, it’s so much easier to use (and easy to clean). 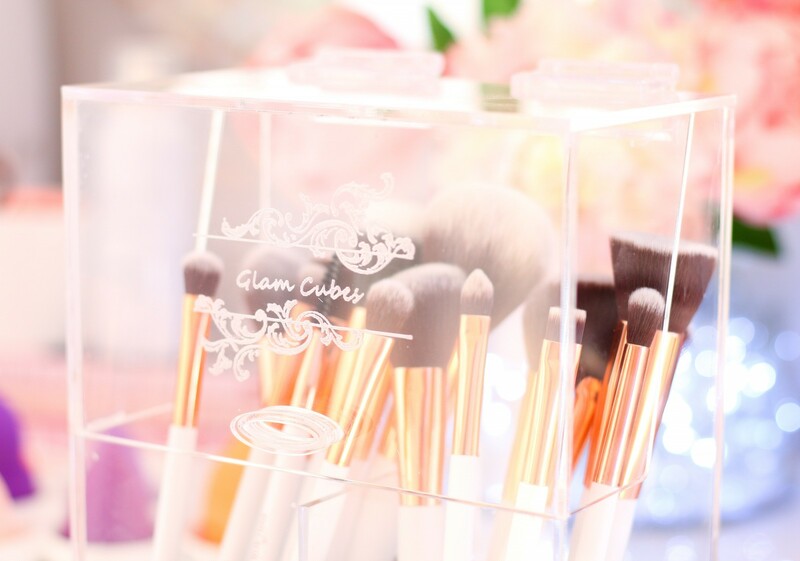 When you purchase a Glam Cubes brush holder, it is delivered as-is with no filler beads. If, like me, you want your brushes to stand up straight, then you’ll have to get yourself a pack of coffee beans or craft pearls to fill the bottom of the holder. I recently DIY’ed gold glitter coffee beans to fill my other brush holders, but I didn’t show them in the photos above because the gold clashed with the copper ferrules on my new MakeupBowtique brushes. Plus I like how the dark beans contrast with the white brush holder base & the white brushes…plus, I’m a coffee addict (and the smell of coffee beans in my beauty room is just heavenly!). 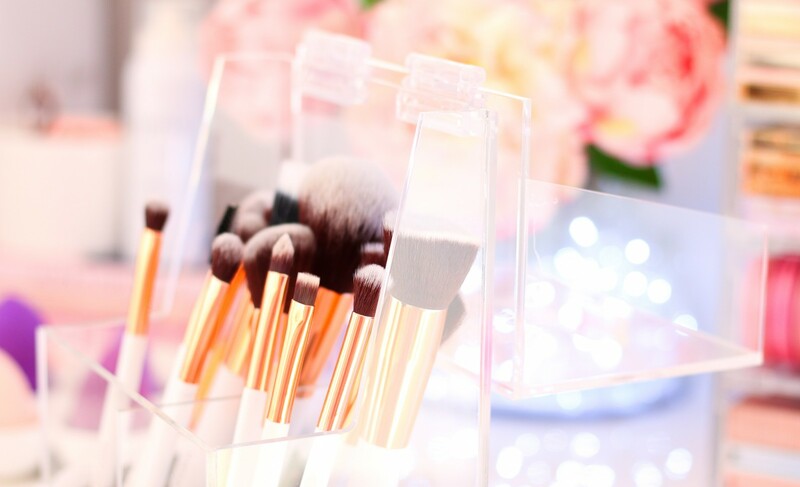 Why choose a brush holder with a lid? You know how you dust and clean your vanity / dressing table on a very regular basis? Well, quickly ask yourself if you actually dust your makeup brushes. And then stop to think about the amount of dust that probably accumulates in the bristles of those makeup brushes. Yep, it’s kinda gross… I know I don’t dust my rather large collection of makeup brushes every week, and I shudder to think about the dust and bacteria that is currently having a little party in there. It’s even worse when the brushes have foundation (or other cream / liquid makeup products) embedded in the bristles because dirt & dust will stick to those bristles. Now imagine applying those dust and dirt particles to your clean face…breakout alert, anyone!? The Glam Cubes brush holders are made of thick & durable acrylic, and features a pretty base design that is available in white, black, red, and pink. The 3-compartment brush holder retails for R450,00 (but as mentioned, I didn’t like it that much) and the 2-compartement brush holder retails for R350,00. 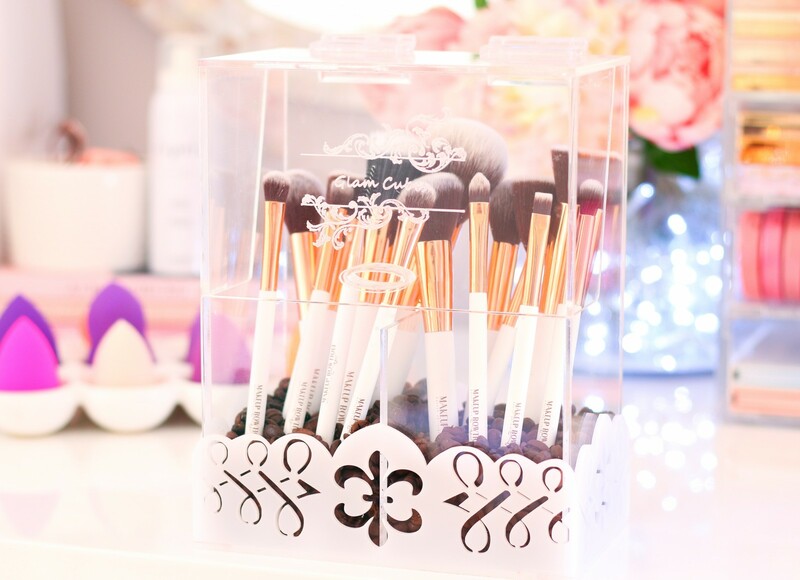 I have 1 x Glam Cubes Makeup Brush Holder (like the one shown in the photos) to give away to one lucky Pink Peonies blog reader! Whoop-whoop! The best part? You can CHOOSE which colour base you want → ‘White’, ‘Red’, ‘Black’, or ‘Pink’ (let me know in the comments section below). ♥ The giveaway will run until 11:59pm on Wednesday, 24 May 2017, with 1 winner being selected at random shortly afterwards. I always announce the winners of my giveaways on Facebook and Twitter, so make sure you follow me on both social media platforms. ♥ Please only enter the giveaway if you plan on sticking around, unfollowers give me the sads. ♥ Brushes and filler beads are not included in the giveaway prize. ♥ Glam Cubes is responsible for delivering the prize to the winner – delivery can take anywhere between 2 to 5 working days. Good luck, my beautiful friends! They are stunning, such a good idea to have a lid to keep the dust out! Would love to win one! I think black would be pretty! I would pick the black or pink! Awesome giveaway! I would love the colour black Thank You for always doing awesome giveaways. My favourite South African blogger ever. 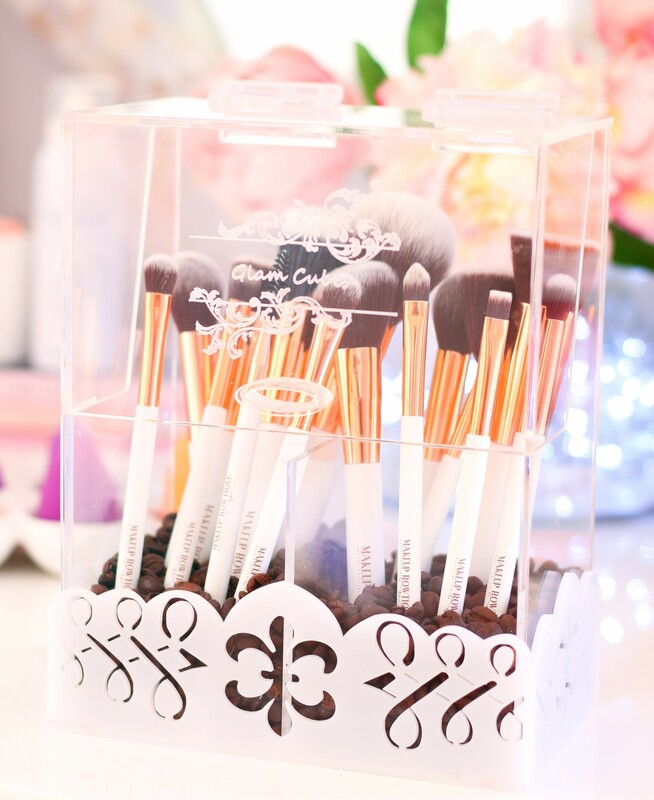 If I were to win this amazing Glam Cube Brush Holder, I would go for white as well. Love the whole clean and clear look – the makeup should add the pop of color so the brushes can keep looking elegant in white! Adore the white at the bottom! Stunning! I am in love with this White is so elegant and beautiful. I would love a black one. So stunning! I always wonder about the dirt on my brush because I know how hectic the top of my organisers and lipsticks get. EEK. Organising my makeup is also something I enjoy doing. Think a white just belongs on my table. This is a lovely product! I would choose…. white! Its so hard. I would pick the white like yours! obsessed! This is so cool and great 8for someone like me who is OCD about dust getting in2 my makeup and being neat and organised. I would LOVE to win the white one! I love it, I would choose white like your one please.. I would pick the black! Oh wow! 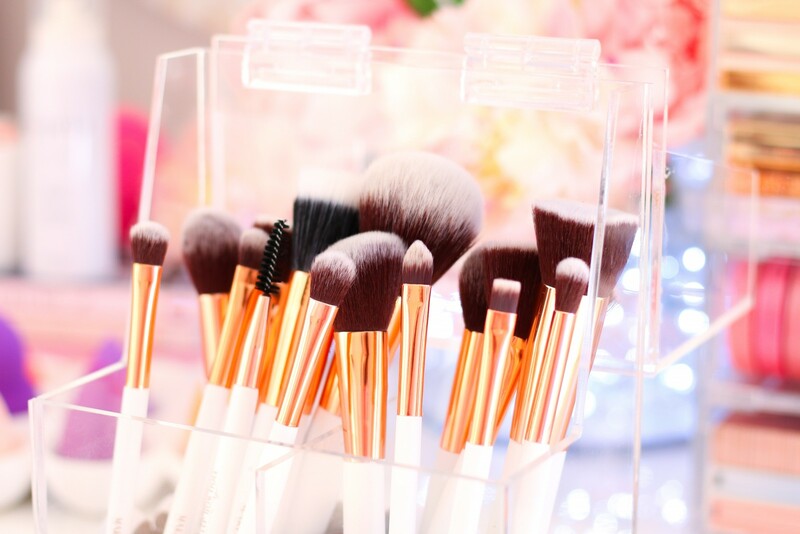 Those brushes just look simply amazing in your brush holder! Love this so much!! White please! Love your blog. I would love the holder in a white base. Like yours! Gorgeous! I’d love a white one! Definitely the black one – black is such a classic colour! 😉 Thank you for the giveaway, luzanne!! I would love the white one!!! The white just looks so elegant! I would absolutely love a black one! This is gorgeous! Gotta get myself some of these storage cubes! White would be awesome. So true with the dust sitting on the brushes. I would love a Black one. I would love the white brush holder. Just like you I love the rooms on Pinterest. All that white and those clean lines. I would choose the white Glam Cube to to match my current theme. Oh I’d definitely go for the white, like yours. The colourful ones might get a bit much after a while, and a darker one might look a bit gloomy! I love this and need this in white! I would love the white!! Oh I’d love the white one please! I would also go for the white one. Love it a lot. I would choose black to fit in with my current colour scheme. Oh how sorely do I need one of these!! Currently my brushes are stacked in a black glass… not ideal! Already had one holder break on me. I would choose a black one. I think I would choose white because it’s so sleek and clean. This was such a lovely post because now I understand the other brush holder in comparison to the flip lid one. And I love the idea more! For sure a black one!! Sleekly Slaying it hehehe! I would pick white as I also have a white vanity. and white would be very classy I think! Definitely the white! I love how yours looks!